Nikolski is located on Nikolski Bay, off the southwest end of Umnak Island, one of the Fox Islands. It lies 116 air miles west of Unalaska, and 900 air miles from Anchorage. The area encompasses 132.1 sq. miles of land and .7 sq. miles of water. Language: Aleut is spoken in three-quarters of all homes. 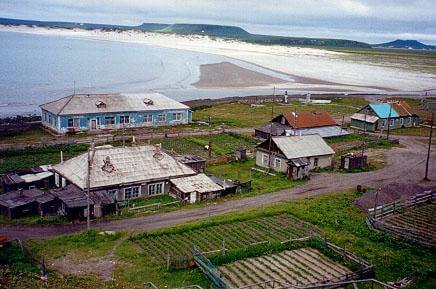 Village History: Nikolski is reputed by some to be the oldest continuously-occupied community in the world. Archaeological evidence from Ananiuliak Island, on the north side of Nikolski Bay, dates as far back as 8,500 years ago. The Chaluka archaeological site, in the village of Nikolski, indicates 4,000 years of virtually continuous occupation. People were living in Nikolski before the Pyramids were built, the Mayan calendar was invented, or the Chinese language was written. In 1834, it was the site of sea otter hunting, and was recorded by the Russians as “Recheshnoe,” which means “river.” In 1920, a boom in fox farming occurred here. The Unangan became affluent enough to purchase a relatively large boat, the “Umnak Native,” which was wrecked in 1933. A sheep ranch was established in 1926 as part of the Aleutian Livestock Company. Climate and Topography: Nikolski lies in the maritime climate zone. Located in the Bering Sea, the weather can change in a minute. Temperatures range from 11 to 65. Snowfall averages 41 inches; total precipitation is 21 inches. Strong winds are frequent during the winter, and fog during the summer, which limits accessibility. Mt. 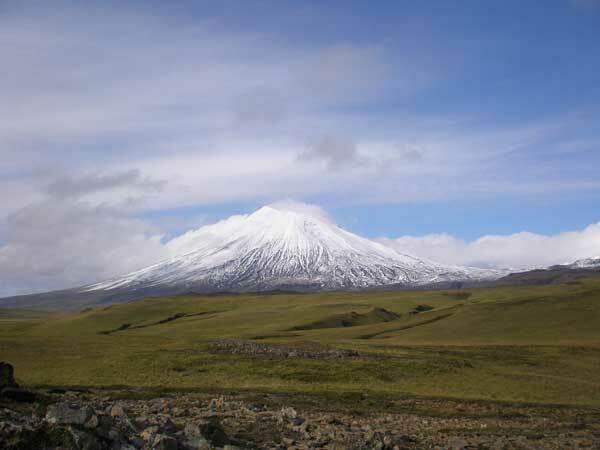 Vsevidof, a 6,900 foot volcano on Umnak Island. Transportation Services and Facilities: Nikolski has a 3,500 foot unlighted gravel runway which provides passenger, mail and cargo service. The airstrip is owned by the U.S. Air Force. It has no landing or port facilities for ships. Barges deliver cargo once or twice a year. Goods and passengers are lightered three miles to the beach. Other Services and Utilities: The twelve occupied homes in Nikolski are connected to a piped water system and individual septic tanks. All homes are fully plumbed. The Council provides septic pumping services. The village has requested funds to develop a treated water supply. Employment / Economy: Subsistence activities, sheep and cattle raising, and fishing-related employment sustain the community. Most residents support themselves by working outside the village at crab canneries and on processing ships. The lack of a harbor and dock have limited fisheries-related activities. The village is interested in developing a small value-added fish processing plant and a sport fishing lodge to attract former residents who left Nikolski for economic reasons. A sport-fishing charter boat was recently purchased by APICDA. 4,000 to 7,000 sheep, as well as 300 head of cattle and 30 horses graze over much of the island. Income is supplemented by subsistence activities, which provide a substantial part of the villagers’ diets. Salmon, halibut, seals and ducks are utilized. Lots of hunters have been to Alaska, but few have gone to the Aleutian Islands. That’s probably because there are no bears, no blacktail deer, no moose, no sheep, no elk, no wolves, and so, not much reason for hunters to head over there. However, two islands offer large herds of free-ranging, wild reindeer. The animals were introduced from far Eastern Russia to Umnak and Atka islands in the early 20th century as a food source for the local native Aleuts. Today, some of the villagers offer guided hunts for tourists. 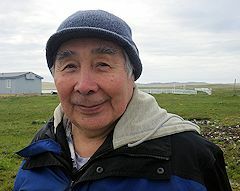 The lodge on Umnak Island is called Ugludax Lodge and is located on the edge of the village of Nikolski. It is a $1 million lodge with all the comforts a hunter could want in a remote location. Housing: There are twelve houses in the community. Elder Arnold Dushkin remembers when the village had 70 or 80 inhabitants.